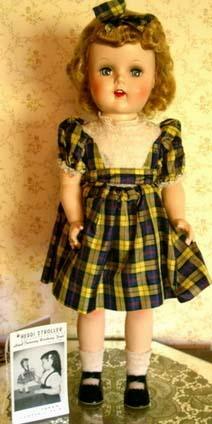 The Belle Doll & Toy Corporation of Brooklyn, New York USA, made dolls from 1952-1958. Belle made hard plastic and vinyl fashion dolls, ballerina dolls, walking dolls and the multi-jointed Twixie the twisting pixie doll. By the late 1950s Belle was acquired by the Effanbee company. 1952 Belle Heddi Stroller doll, 20"tall, hard plastic head that turns when she walks, sleep eyes, real eyelashes, open mouth with teeth, saran combable wig, five piece jointed walker body, wore a plaid school girl dress with white socks and black mary jane shoes, came with an instruction pamphlet that stated A Belle Doll. 1956-1957 Belle Doll & Toy Marjorie doll, 19" tall or Belle Margie doll, 17 or 20" tall, both dolls have hard plastic bodies & arms with vinyl head, Cissy type face mold, sleep eyes, closed mouth, pierced ears, rooted hair in various colors, high heel fashion dolls with jointed knees, some dolls are marked on neck GV and on bottom V205-E, others are unmarked. Dolls came in several different outfits from casual dresses to formals. 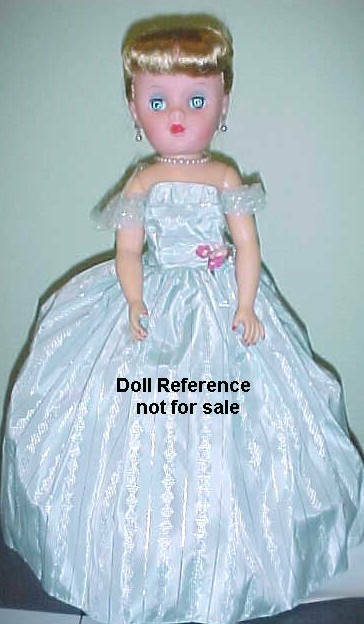 There is a smaller Miss Revlon type, 10" tall doll companion line, called Little Miss Margie doll or Little Miss Marjorie doll marked circle P or unmarked, had a separate wardrobe of beautiful clothing that could be purchased. 1958 Belle Doll & Toy Twixie the Twisting Pixie doll, 19" tall, multi-jointed, hard plastic body with twelve joints; neck, shoulders, elbows, waist, hips knees & ankles, vinyl head with rooted hair, sleep eyes. Competitor of Uneeda's multi-jointed Dollikin & Valentine's Manikin or Mannikin same size dolls. Came wearing a very similar outfit to the Dollikin's lotus blossom oriental outfit, doll marked P-8. Doll is shown without clothing so you can see the body construction. 1958 Belle Twixie the Twisting Pixie doll, 19"
vinyl stuffed body and limbs, separated fingers, detailed toes, doll marked 14 on head. Photo N/A.